I really didn't understand why I watched this all the way through to the end. It was odd. Had no real substance. The characters didn't really make any sense at all and it seemed like it was over before it got anything really explained. Just not for me at all. The only reason I'm giving it 3 stars is because I did watch it all the way to the end. 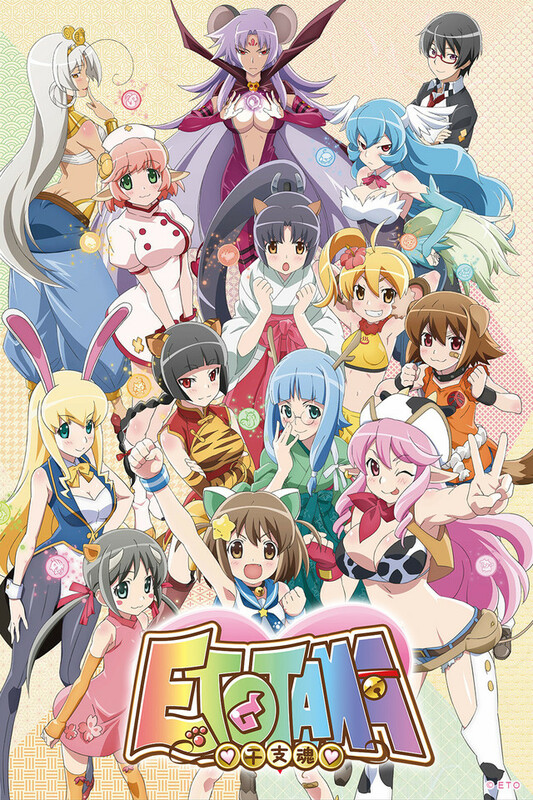 Etotama was a weird ride, filled with moe, and a popular type of comedy that I usually don't like but, after watching it all the way through, that message of love began to truly appeal to me. I don't know how to say it quite, but I really like how the message of friendship is uniquely conveyed in this story. Friendship and reliance created the villain of the story, mercy caused the hero to get amnesia and become weak, but still, after all that, love saved the hero, the villain, and the whole cast to boot. Takeru symbolized the healing power that people have: that sincerity would give you strength. The actually quite deep metaphors sprinkled throughout, as well as the gags that were used seemingly to cover them up, made the story... charming. I don't know if I would personally suggest it to others, but I think it still deserves to be known. But really though the girls are cute and thats all i need. If you can imagine a drunken clown riding a bear with the head of a fish down a stream of skittles in the hopes of impressing a cute girl, youve spent to much time on the internet and must be very sideways in the head. And as such you will love this show very much. Okay. Has lots of things, but doesn't excel at any of them. Unfortunately, it doesn't really do any of these things great. You got used to seeing some character more than others, but there is very little character development. It pretty much unloads it all at the end. Overall, I'm not dissappointed with having finished it, but I could have dropped it early on and I wouldn't have missed it. I wouldn't recommend it to anyone, unless you just want something to listen/watch while doing something else. Me and my girlfriend have been watching this together and we both absolutely love it! The anime as a whole is actually very interesting. It involves many fanservice situations, but the development of Nya-tan as a character is really well made too. The only problem is the end, where I was as confused about what happened (or didn't happen) as Nya-tan. Even so, I recommend it for those looking for a quick story without too much depth but fun all the same. Beautiful animation, but also one of those shows that gives you the "meh" feeling. The deeper plot-lines have some great aspects, but then there's a lot of casual comedy. The personality tropes at the beginning do not really transfer at the end of the show, and then there's the main character. Comparing other shows when they do the etotama battles is actually quite brilliant. I dislike that particular style but how they created the animation for the aspect makes it feel more 'alive'. Where they are actually jumping into a 'virtual game' of sorts. Other then these aspects there's a lot of "Meh" where you don't really feel like it's good or bad. The Ending You Didn't Deserve. While EtoTama's flashy lights and unique fighting scenes will keep you satisfied the ending will leave you high and dry like the day you almost thought senpai would notice you. 3/5 stars because even if I was disappointed with the ending I did enjoy the ride with bright colorful characters and comedy that tries a bit too hard at points, it's a equal dash of the good and the bad. Really, don't think too hard. You'll only hurt yourself. This show is all over the place and crazy but in it's own charming way. It's fun to watch but don't try to figure out what's going on or how it all makes sense in the end.